PodcastOne: Can We Just Have Crossplay Now? Can We Just Have Crossplay Now? Adam is sick today, so it was just Cliff and Dylan holding down the fort for Episode 114. Cliff was also sick, but not as sick as Adam, so please excuse any sniffling and coughing. :) In our now playing section, Dylan told us all about a new board game he's been playing called Gloomhaven (https://amzn.to/2UtnuOO). 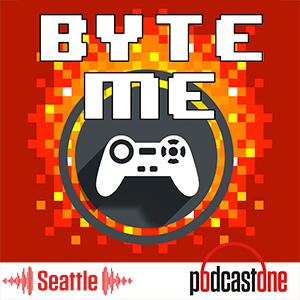 Cliff is still busing playing Hellblade for Byte Me DLC Plays (http://bit.ly/2Wvpece), he finally got to play Rocket League via crossplay with everyone and got to try out the Anthem VIP Beta. In news, we found the best way to catch up with Kingdom Hearts (http://bit.ly/2CVvXTy), there are now over 500 games in the Xbox Backwards Compatibility program, GameStop appears to have screwed up the Kingdom Hearts PS4 pre-orders, Metroid Prime 4 probably isn't going to come out for a while (and Cliff has a lot to say about EA and Nintendo), you could win $250k as a virtual farmer and AC: Odyssey is going to fix their broken DLC. Vinny had a great question about what the future holds for the Epic store and how Valve needs to change to compete and Joe wants to know what the next round of games that get crossplay should be (but wasn't willing to accept "all of them" as an answer!) We rounded up Games with Gold for February, talked about the new PS4 Humble Bundle, what games you can get free from Epic next month and accidentally skipped that Pikuniku is free on Twitch Prime (whoops!) We don't do Small Bites that often, but this week wanted to shout out sloth<3chunk and stony419 from Clan Goonies 2 who dropped into Discord repping the mobile game Smashing Four. Dylan and Cliff will give their impressions next week.